Immerse yourself into Jelli's Wonderland and discover wondrous things and relaxing stories! Today’s Jelly is cute, harmless and on top of it vegan as well  In this latest app we don’t merely play a game, we rather experience it through beautiful graphics and a child-oriented narration. Are you ready for lively excursions in “Jelli’s Adventures“? 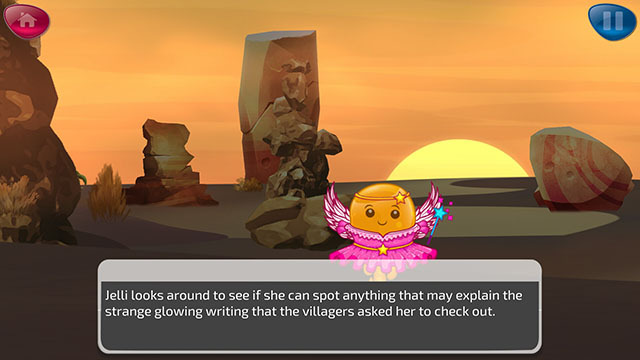 Fairy Jelli is looking for glowing writings in the desert. When you enter the game you’ll get to choose Jelli’s costume: currently either a fairy, an adventurist or a festive one. Depending on your choice, you’ll enter different worlds. After you’ve chosen your chapter the story starts. But rather than a game, you’ll enter a tale that is narrated by a professional narrator. So you’ll join Jelli on its adventure on a trip of discovery or a festive story. The possibility to read along or just listen to the text makes the game suitable for varied age groups of children. Additionally to the enthusiastic narration and the atmospheric sound effects like the crackling of the fireplace and the sound of the jungle, the graphics underline the fondly designed app. 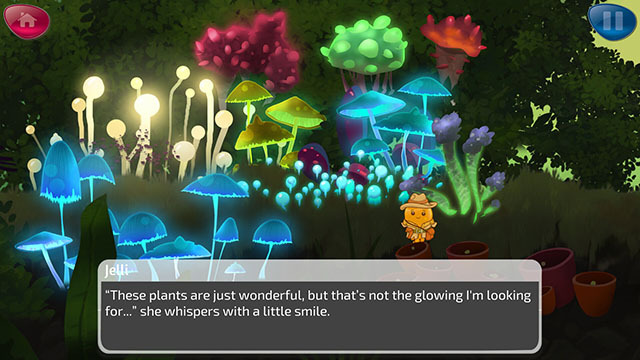 A colorful palette and the selected animations underline the cute stories of this child-friendly game as well. The narrative game leaves a great impression, only one downer weights more heavily: To skip a 30-seconds ad, it is necessary to wait 16 seconds. Even though you can buy an ad-free version, that time span is way too long! Another minor suggestion for improvement is that there are some words during the narration of the Christmas story St. Nicholas that are cut off. It is nothing too major though, as the sentences are still understandable. All in all, I would love to have further characters to choose from and more chapters to play. I am sure that new ones are already on their way and I can’t wait for that! During the waiting time, children could possibly watch and listen to the present chapters more than once nonetheless. Adventurous Jelli in a mysterious mushroom forest. Whether you’ve got children, younger siblings, nephews or nieces, I recommend showing them this game during their phone time. It is exciting enough to enthrall them without being too hyped up. You can download the game for Android or iOS.